Lily bulbs are the fleshy, underground buds that act as the food reserve for lilies, which are herbaceous, flowering plants that are found and cultivated in numerous countries around the world. The bulbs of these plants are often used in herbal remedies, most notably in traditional Chinese medicine where they’re called “bai he”. In this system of medicine, lily bulbs are said to have sweet and slightly cold properties, and are associated with the meridians of the heart and lungs. Lily bulbs continue to be used for all sorts of medicinal purposes even today. As the food reserve for lilies, the bulbs are packed with a variety of important nutrients in varying amounts. In addition to the starch and protein content, lily bulbs are said to have calcium, iron, phosphorus, folate, potassium, and vitamins B1, B2, and C.
Lily bulbs are most commonly used to treat respiratory disorders such as chronic dry coughing and bronchitis. This is because lily bulbs are believed to moisten the lungs and clear heat from the respiratory system, soothing the lungs as a result. In other words, lily bulbs can act as an expectorant to clear up lung congestion. This makes them ineffective against coughs with copious amounts of phlegm, however, so those with particularly wet coughs should avoid lily bulbs. In addition to relieving all kinds of respiratory disorders, the cooling property of lily bulbs extends to remedying chronic low-grade fevers. People suffering from insomnia are often given dried lily bulbs to encourage restful sleep and lessen irritability. This is because lily bulbs have a sedative effect, thus making it easier to fall asleep. The sedative quality is said to be good for the heart as well, as lily bulbs are believed to decrease heart palpitations and ease off extra strains on the heart. Note that lily bulbs are somewhat hard to digest and a little sticky, so individuals with stomach problems should exercise caution when consuming lily bulbs or avoid them altogether. Lily bulbs are best known for their positive impact on the lungs and heart: lily bulbs moisten the lungs to prevent dryness and to make it easier to expel phlegm, while also relaxing the body and decreasing the strain placed upon the heart by stress. Because of their purported cooling effect, the lily bulb is a food most commonly associated with summer. They possess a sweet taste, crunchy texture, and a faintly perfumed aroma which make them a usual addition into summertime stir fries, sweet and savory soups, and other cold dishes. Jacqueline M. Newman of FlavorAndFortune.com has shared numerous recipes that make good use of the distinct flavor of lily bulbs, most notably lily-stuffed pears, hundred get-together shrimp, and pork and lily bulb soup. Those who’d rather experiment with lily bulbs on their own can best enjoy them paired up with white fungus, honey, celery, and garlic. 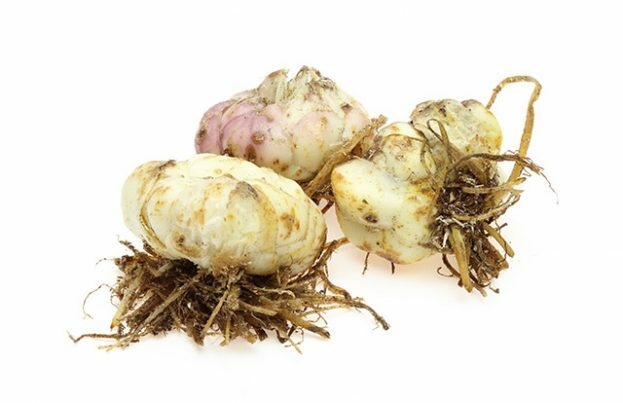 Fresh lily bulbs are often available in the produce section of Asian supermarkets, while dried lily bulbs can be purchased from Chinese herbal stores and select Asian supermarkets. Lily bulbs can support and nourish the lungs by alleviating and preventing respiratory disorders such as chronic dry cough and bronchitis. They’re good for the heart as well thanks to their ability to ease heart palpitations, which in itself is a result of their effects on insomnia. Lily bulbs can be use to treat fevers too.